The Scotts Reel Mower is an Americal classic in every sense of the word. Countless Scotts push mowers were sold over the decades - many are still in regular service. Scotts was known for making a sturdy, reliable machine that could take a hard day’s work without complaint. Scott’s trademark mower of yesteryear was a ‘silent’ model that provided a good cut with less noise and effort. The modern Scotts push mower has incorporated technology to keep the weight ( and the price) down. Now manufactured overseas, and sold in large outlet stores, this mower brand remains very popular with the homeowner who has a smaller lawn. 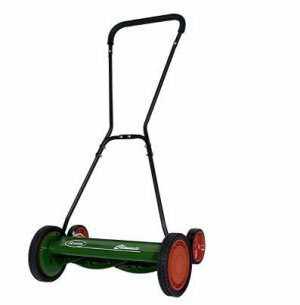 The Scotts Reel Mower weighs in at 30 pounds, which is at the upper limits of most modern push reel mowers. The loop style handle helps compensate for the extra weight, allowing more leverage when pushing and turning. Unlike its predecessor, the modern Scotts mower is not ‘silent’ - the cutting blades come in contact with the bed knife. The 5 cutting blades are tempered alloy steel, riveted to the support reel. Ball bearings come standard. The fact the blades come in contact with the bed knife means sharpening will need to be done more often - usually every 1-2 years, depending on the frequency of use. A home sharpening kit is available. Scotts mowers sport an innovative rear wheel design, instead of using a roller. This allows for greater maneuverability, and also allows for a higher cut. Scotts 3 inch maximum height of cut is among the highest in the industry. For those living in a dry climate, the added cutting height is a great feature that helps save water ( and your lawn). A shrub bar is mounted on the front of the mower, to prevent unwanted objects from entering the blades. For those homeowners looking for an economically priced push reel mower, the Scotts brand fills the bill. Plan on spending about $170.00 at an outlet store for this machine.